The British Transport Police History Group (BTPHG) exists to promote the history of the British Transport Police and to preserve the historical records and artefacts of all its constituent forces wherever railway, dock and canal police forces were operational. And to encourage and facilitate historical projects relating to the BTP and constituent forces. The BTPHG was formed in 2009 and receives the support of the National Association for Retired British Transport Police Officers (NARBTPO). Membership is open to retired and serving officers and staff of the British Transport Police and any other individual or organisation. The British Transport Police Force has its roots very early in the history of the British police service. The earliest record of a railway police force pre-dates the formation of the Metropolitan Police (usually recognised as the first modern police force in England & Wales), by at least 4 years. 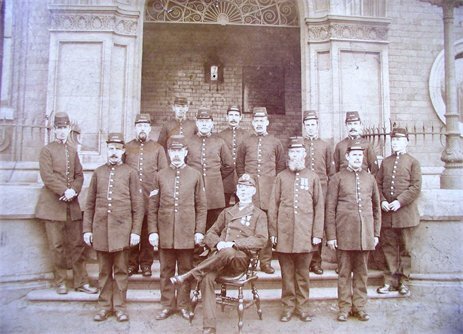 No-one really knows just how many individual railway, dock and canal police forces existed in the 19th Century, but they probably numbered over a hundred. Largely unsung and – in many cases, unremembered – these early forces combined to form the modern BTP and give it one of the richest histories of any police force in Britain. Sadly though, much of this heritage has already been lost through fires, war and apathy. Police at Grimsby Docks, 1895. We welcome any opportunity to preserve the history of policing the railways, canals and docks of Great Britain and safeguard this heritage for future historians. Great Eastern Railway Police. 1911.